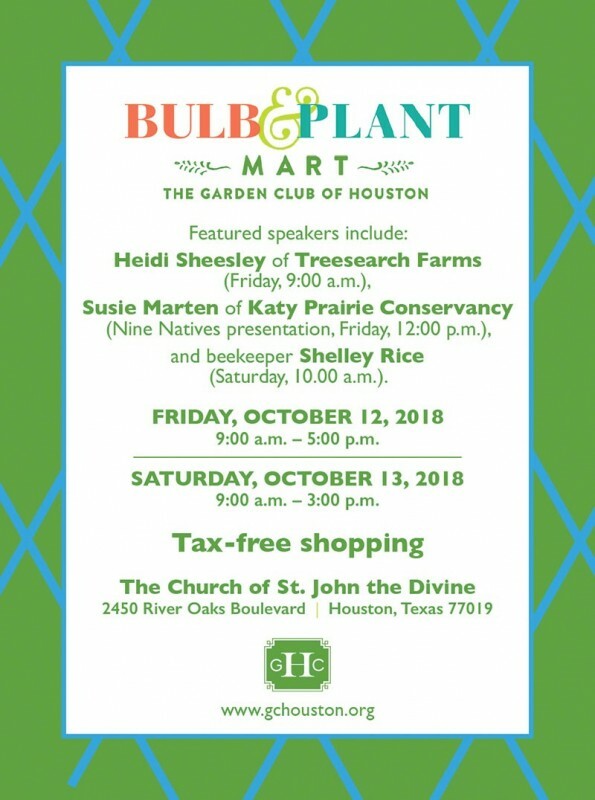 The Garden Club of Houston's Annual Bulb & Plant Mart offers top-quality bulbs. Experienced and beginning gardeners alike will find an expanded collection of hard-to-find and unusual Crinums, Daylilies, Gingers, perennials, trees, shrubs, vines, herbs and citrus plants, including exclusive offerings grown specifically for the Mart from the gardens of GCH members. The Plants that Merit Attention Booth, hosted by Nancy Thomas, a horticultural award-winning GCH member and Past President of The Garden Club of America, will be featured on Saturday morning and will offer noteworthy selections collected specifically for the Mart. Additional special exhibits will include the live butterfly tent from The Museum of Natural Science Cockrell Butterfly Center and the Conservation Booth, which will feature a variety of native and drought tolerant plants curated by experts in ecological conservation and education. The proceeds from the Mart are used for the purposes of stimulating the interest in and knowledge of gardening, enhancing the beauty of our city, and protecting and restoring our fragile ecosystem.